Several media agencies that I know of, are now doing their own creative – yes, in-house. This is because, typically, it is the media agency that is sitting on a lot of useful data, and they are already using it for their programmatic approach to advertising, and they are the first ones to have realised that 'programmatic buying' coupled with data-driven creative can deliver more effective digital advertising campaigns. 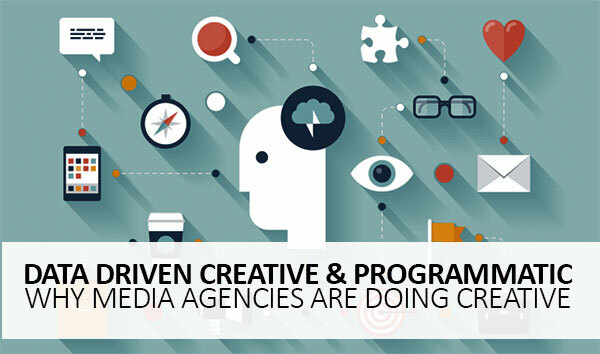 Two out of three of our own media agencies at MCN have their own creative departments. This, when we have the region's top creative or brand agencies, right here in our building. It started with close collaboration throughout the process between the media and creative agencies – and that still happens, but some media agencies have gone a step further to bring creative in-house. And, for social media, not just media agencies, but PR agencies are doing the same. For online display creative, in particular, data drives and provides the insight that makes for effective advertising. Combine that with programmatic, and you have a powerful tool at hand. What kind of data is driving creative? There are multiple sources of data, but first party data seems to be in the lead. CRM data is a big source. But brands today are sniffing out more and more. Website analytics data is another strong provider of signals. As is audience data from the website and so is contextual data. Today we know from website analytics, which pages with which products do better, we know audience slices of age, gender, geography and interests, and we also have access to media type, location, device information that helps us figure out what works and what doesn't. Put those together, and you've got terrific insights towards better creative. The old way was the creative agency would create the ad, hand it over, and the media agency would "deliver" it. Or, the media agency would develop a strategy, a media plan, and ask the creative agency to develop "ads" to fill in those blanks. Today, hopefully, collaboration on campaigns starts from the first brief – where both agencies (or departments) are briefed together. Today, with programmatic in place, analysis, planning and creative need to work together to maximise the true potential of the approach. Insights from data driving the holistic campaign process – including media and creative – is allowing for brands to have relevant, customized, targeted campaigns, and that's a whole new way to work. Which, often, creative agencies are not familiar with. Which is why, media agencies are beginning to do their own creative. What a brand really wants is an effective campaign – each and every time. And we know today, that there is enough data to help derive meaningful, deep insights so that both the what (the creative) and the where and when (programmatic) can work in dynamic synergy. The results are smart, effective, campaigns that are built on sniper strategies. The one shot gets it kind of work. By the way, this is hugely relevant to social media, and not just display ads. Increasingly, content for social is also being done in-house by media agencies. Are media agencies going back to the good old days of one agency does it all? Remember when the agency was the agency. They created the ad, bought the space in the newspaper, and bingo, you had a campaign? Today's media agencies, aren't necessarily going back to the 1970's like that. Today, with data sophistication, all they are doing is making sure that what they are planning for is effectively executed via ads that work in context, and are relevant. And they're doing it quickly, without the back and forth, without the ego hassles involved. Or, where they are not bringing the creative in, they are actually asking for their clients' brands to ensure collaboration from the beginning. That's a good sign. That is powerful. This is just an amazing post, thanks. Yes, one of the agencies we work with on the media side have asked our creative agency to join in on every campaign brief, and we see some good results. I am not sure if this would mean at some stage they would also start doing their own creative, but early collaboration helps. We're in the North Eastern market in the US, and we are a small media agency. While we do not use programmatic (yet), we do our own creative. That's what gives us the edge. I totally agree with you. The marketing environment of today is “evolving” rapidly. I’ve been noticing the same trends you have been observing. Social Media, in particular, is becoming increasingly more sophisticated. In turn, social media is more complicated. Media Agencies, too, have to evolve with the changing climate. Have you any thoughts on the rise of Search Engine Optimization Companies and Social Media Management Companies?
. I really too happy to read it. So much necessary information i'll get from these topic.Thanks once again.